Drumcliff is, by and large, easy to find. If you are driving from Sligo Town on the main road up to Donegal, you will pass through Drumcliff (sort of). Blink and you'll miss it, as the main buildings are indeed a few farms, a pub, the stump of a round tower, and a church. And here, at the church, you might want to stop, even though it is a "special interest" site only. But rest assured, there are so many diverse interests involved that it is worth a stop for nearly everyone. You get a round tower (well, the remains of it), a high cross, a dead poet, a stunning view and a great snack. Beat this for value! How would one describe Drumcliff in the most concise manner? Well, maybe by mentioning the following. Drumcliff occupies a stunning location at the foot of impressive Benbulben, not far off the Atlantic coast. The remains of the round tower and the elaborately carved high cross highlight the early Christian heritage of the area. 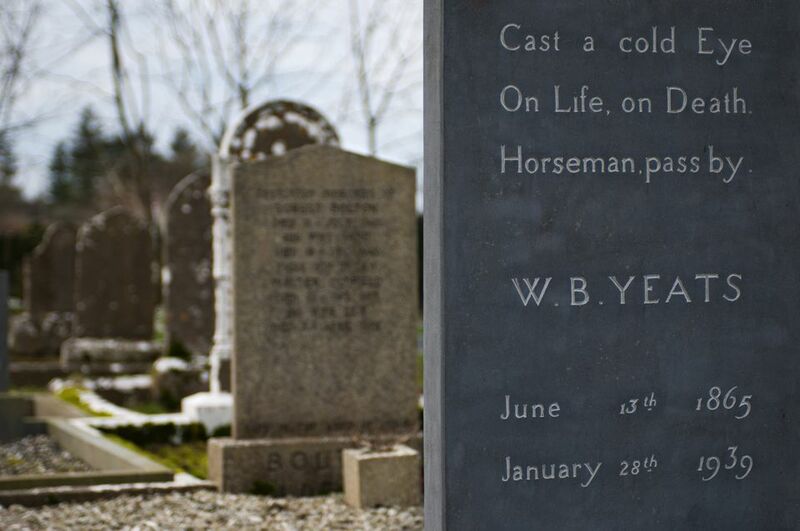 There is the simple grave of Irish poet W.B.Yeats. There is an excellent coffee shop. You'll ultimately have to be interested in at least one of these, but still worth a stop if you are passing through, if only for a tea and a scone. Drumcliff was an early Christian site, as you can still discern today. The still impressive stump of a round tower, plus an interesting high cross, are reminders that there once was a monastic complex here, now rudely bisected by the main road. This has been a hallowed place for centuries before W.B.Yeats added his personal twist. In fact, the monastery was founded by Saint Columcille (Columba) himself, one of Ireland's foremost saints. Later, the location beneath Benbulben made Drumcliff a favorite spot for Irish poet W.B.Yeats, who longed to stay forever. Hence, Yeats' grave is today located in Drumcliff churchyard. Drumcliff is, in many cases, on the tourist map for one reason only: the mystical and mystifying Irish poet W.B.Yeats, who wrote about the area and chose the tiny churchyard as his final resting place. He wanted to lie beneath Benbulben in eternity. He even composed this in his own epigraph, much-quoted today. But Drumcliff has much more than a dead poet to recommend a stop. To top it all off, the grave of Yeats may not even be his at all... but that is another story. Indeed, Yeats' grave is the one feature most likely to be overlooked by many tourists. When you approach Drumcliff on the Donegal to Sligo road, you will first notice the remains of a round tower. The massive stump is reputed to finally collapse when an intelligent man passes by (obviously, these are in short supply). Then again, I always seem to feel a small tremor in the ancient ruins when I am nearby. On the other side of the road, within the confines of the old monastic site, and now almost a part of the cemetery wall, you will find an impressive high cross, set into the graveyard wall. With a host of very fine carvings depicting scenes from the Bible, this being a so-called "scripture cross." The artist even seems to have attempted to portray a camel on one panel, an unusual feature at least. One wonders where he had seen a camel before. Was it in an illuminated manuscript or was he well-travelled? The other carvings, however, are mostly in line with traditional design. From the cross, you can also admire the view towards Benbulben, the massive table mountain dominating the horizon towards the North. Continue towards the church and you will find Yeats' grave nearby, simple and well-tended. You will understand why he chose this place for his final rest. Another famous Drumcliff-ian is remembered with a poignant statue near the coach car park: Saint Columcille, who founded a monastery at Drumcliff in 574. The finish of your visit in the small café between the church and the graveyard, whose reasonable prices and inventive paninis make for a satisfying snack experience.